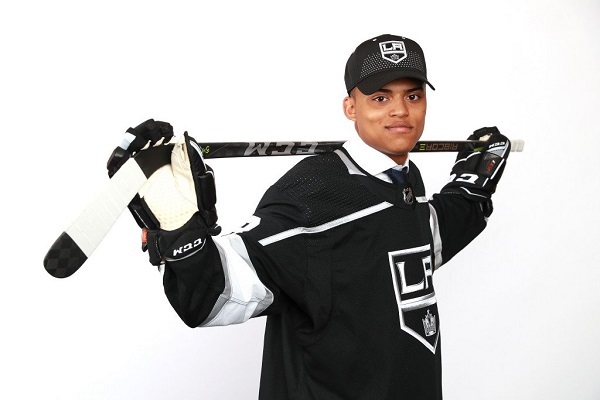 Selected in the second round of this year’s NHL Entry Draft, Thomas is among a group of prospects arriving in Los Angeles for Rookie Camp this week, all sharing at least one thing in common – they grew up only knowing one Kings team, that of a winner. They don’t connect with Marty McSorley and the ’93 Finals. They remember Dustin Brown in 2012. Similarly, Blues forward Geoff Courtnall likely means nothing to them. Instead, St. Louis is just some team the Kings have been beating in the playoffs recently. Even the name Roman Cechmanek doesn’t register; nor does a big trade with the Avalanche in 2001. Those aren’t even passing thoughts. Instead, it’s further proof that the decades prior have truly become a distant memory. Fast forward to 2018 and we’re no longer talking about players who played at the Great Western Forum. When teenagers today think of the LA Kings, they only know a winning franchise. Doesn’t sound too bad. Thomas goes from playing forward by default to being drafted 51st overall. Yes, probably. This isn’t a Brian Boyle situation, where you can look for the player to switch positions after being drafted. Thomas is coming to camp as a forward. Clearly, the spot suits him, as well. Thomas was a consistent goal scorer over the past two years with the OHL’s Niagara IceDogs, notching 21 and 22 goals. During the 2017-18 campaign, he more than doubled his assist total from the season prior (increasing from 27 to 59), giving him 81 points in 68 games played. He then remained a point-per-game player in the playoffs, recording 11 points in 10 post-season contests. Thomas is expected back in the OHL this season, which is quite a contrast from the road his father traveled as a minor-league hockey player. During a 12-year stretch from 1996 to 2008, Kahlil Thomas suited up for 13 different teams in nine different leagues. Off the ice, Thomas remains a big gamer and admits that when he plays his NHL game on Playstation, he always uses the Kings as his team. Perhaps it gives him a chance to channel his inner Doughty and Quick during those times because when he hits the ice for real, he’s clearly settling into his role at forward. Thomas’ connection to the Kings doesn’t merely stop there though. Having only been a member of the Kings organization for a few short months, it’s all still a bit surreal for Thomas, who won’t turn 19 until January. As quickly as things are happening, reality may start creeping in fairly soon. A week after the Draft, Thomas was in LA for Development Camp. Then, last month, he attended Team Canada’s World Junior Championship evaluation camp – yet only after being added to the roster just a few days before it started. “When I saw the initial list, I was kind of disappointed and I hoped that if something happened, I would be a guy that was called upon,” he admitted. Unfortunately, Thomas ended up getting hurt in the second period of the first game, so he was never really able to put his full talents on display. Until then, Thomas still has several items to juggle. He had been training with the IceDogs back in Niagara prior to flying to LA this week. Now, he’ll turn his attention to the Kings again – albeit, probably just for a brief period. Thomas is scheduled to wear No. 86 at Rookie Camp this week. While your first NHL number – even your first camp number – is usually a big deal, it won’t hold nearly as much weight for Thomas as the No. 55 tattooed onto his chest. Someday in the future, when Thomas slips on a Kings jersey for his first official NHL game, regardless of some digits sewn on the back, they won’t be the number running through his mind that night. Meanwhile, the crest on the front of that same jersey could be that of his childhood team. All of it speaks of a Hollywood-type story in more ways than one. Excited to see his progress.